Disclaimer: I am not a professional electrician. I was given advice by someone that has done this for many years. Please proceed at your own risk using these instructions, or consider hiring an electrician. If you have any helpful advice to share, I will add your comments to this blog post. Thank-you! 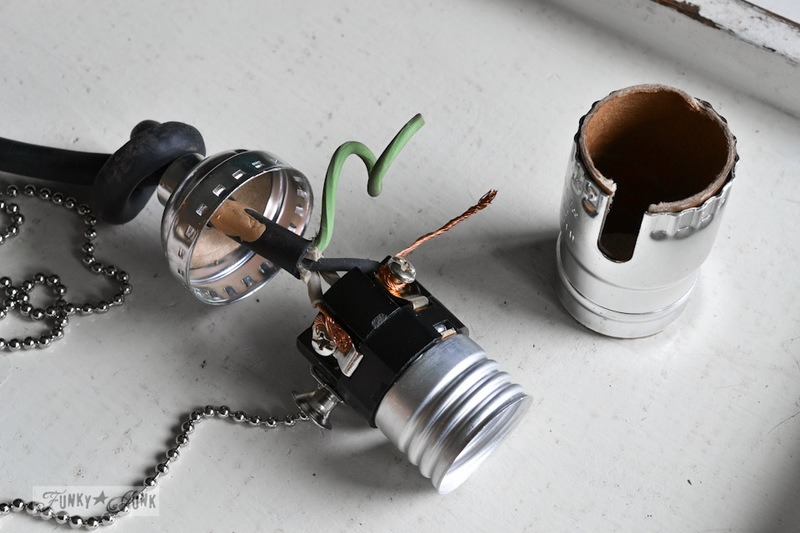 Part 1 – How I made the oil funnel gear junk lamp is HERE. Buying a ready made lamp in a store is easy. But if you’re anything like me, you may have been pining for something a little more original. 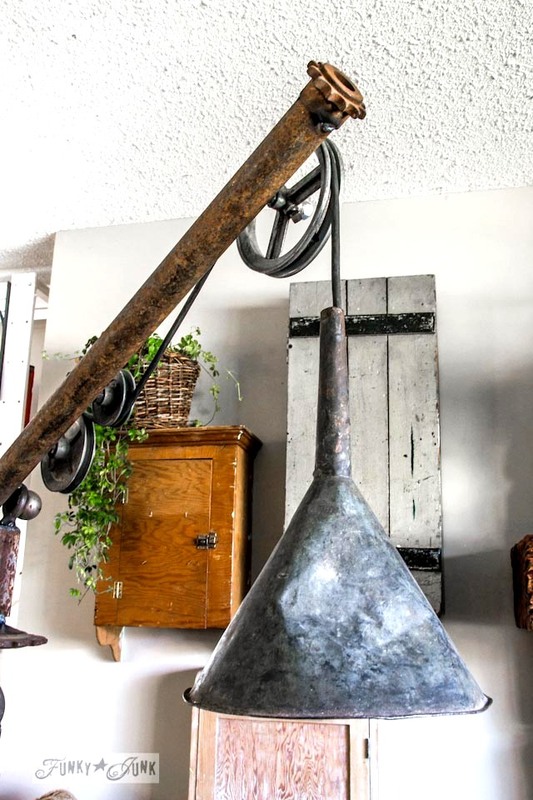 So you go ahead and make an oil funnel gear junk lamp. But with every homemade lamp, you also need to wire it. I’ve never wired a lamp before, so I admit I was a little nervous. I mean, no one wants to die before their time. Electricity is a big deal so you need to be informed. Disclaimer: Please PLEASE involve supervised instruction with your wiring projects. Please follow these instructions at your own risk or hire professional help. So after I received a little instruction from Dan, I went shopping. 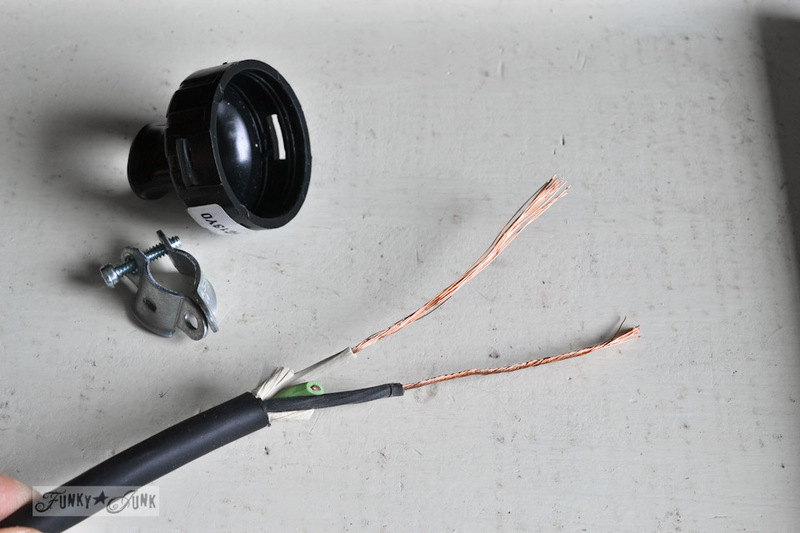 Here’s how to wire a junk lamp. Or… one like this anyway! 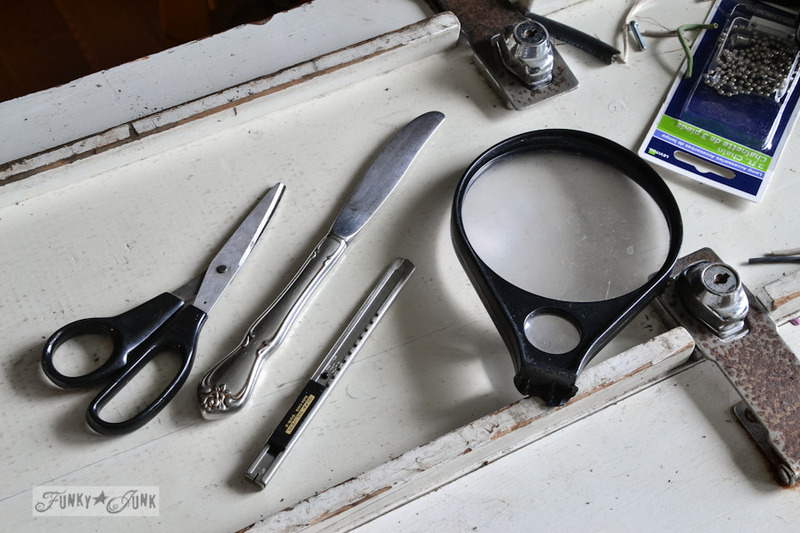 My weapons of choice were scissors, a butter knife, an exacto knife, and a magnifying glass. There are much thinner lamp wires to choose from, but Dan uses this heavy gauge wire in his shop for his own creations, and I loved the look of it so we went for it. It consists of a positive, a negative and a ground. When I went to the lamp store to buy the socket and plug, I showed the salesman what wire I used and his eyebrows nearly jumped off his head. He verified it was safe but definitely overkill and that I didn’t need the ground. And then when he wanted to know what kind of lamp could handle such a cord, (heh) I tried to explain what my lamp looked like. That’s when his eyes dried out next. Sorry, guy! So if you use overkill wire, just make sure it’ll work with your chosen socket and plug. 1. 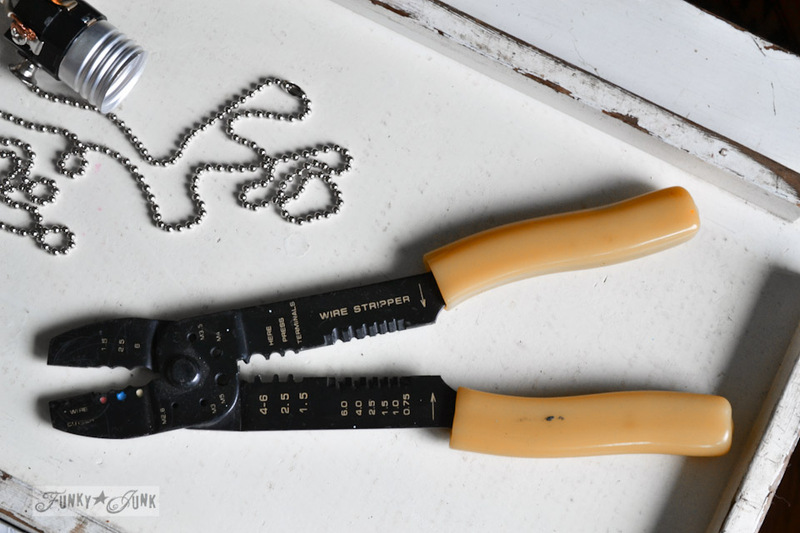 Gently scoring with (wire cutters) scissors, cut the outer coating of the thick wire to expose the insides. 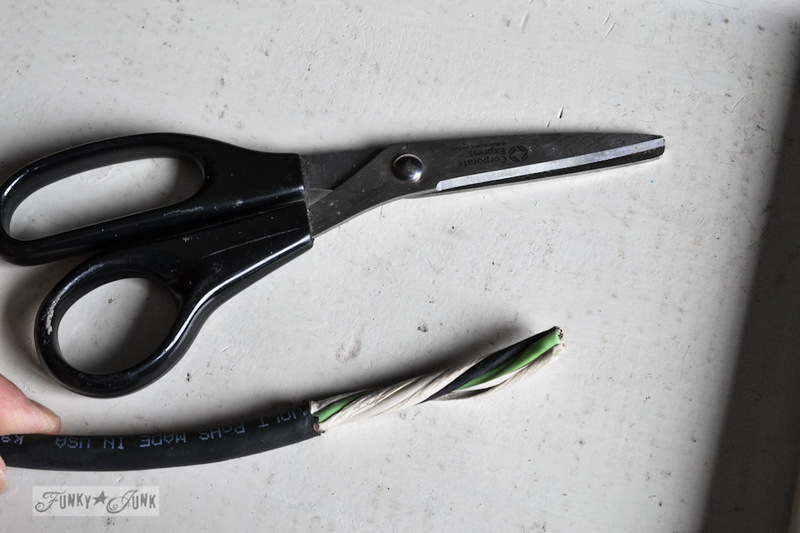 If you cut through any small wires, you have to snip off the works and start over, so just take your time. 2. Separate the 3 wires and cut off the inside paper like wire insulators. Since this is a lamp, I was told I didn’t need the ground wire so I cut off the green wire too. 3. Using the exacto knife, gently score along the length of the black and white wire coatings, exposing the copper wires inside. Bend back the white and black and trim off. 4. Tightly wind the copper wires together. You can’t even miss one so keep taking your time. You are now ready to install either a plug or a lamp socket. 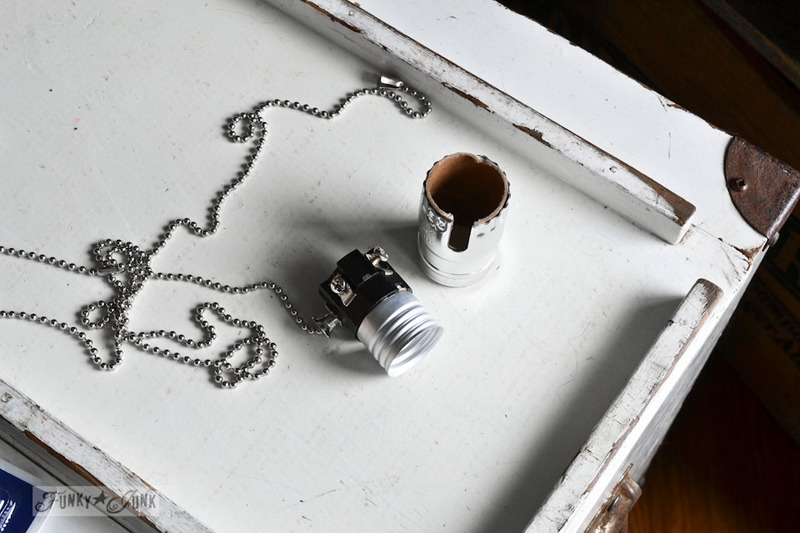 This is a pull chain lamp socket. 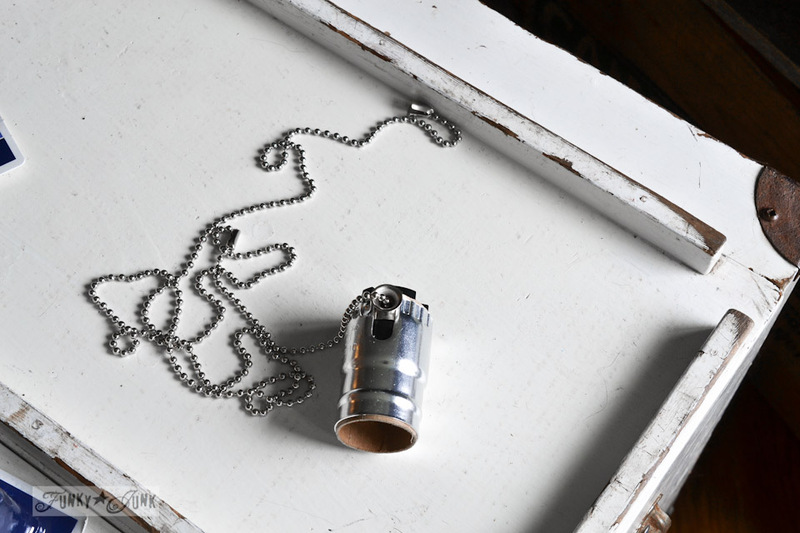 There are many other styles to choose from, but I thought it would be cool to turn the lamp on and off with a pull chain, (more bling) so I also picked up a chain extension as well. 1. Pull the lamp socket covering off to expose the screws. One screw is white (positive), and the other is copper (negative). This is where I needed the magnifying glass. You can’t get this part wrong. I could barely make out the copper screw, so I took the wire outside in natural light AND used the magnifying glass. The copper screw people really ought to put more copper on the screw because I could barely make out the difference. But it’s important to figure it out regardless. 3. 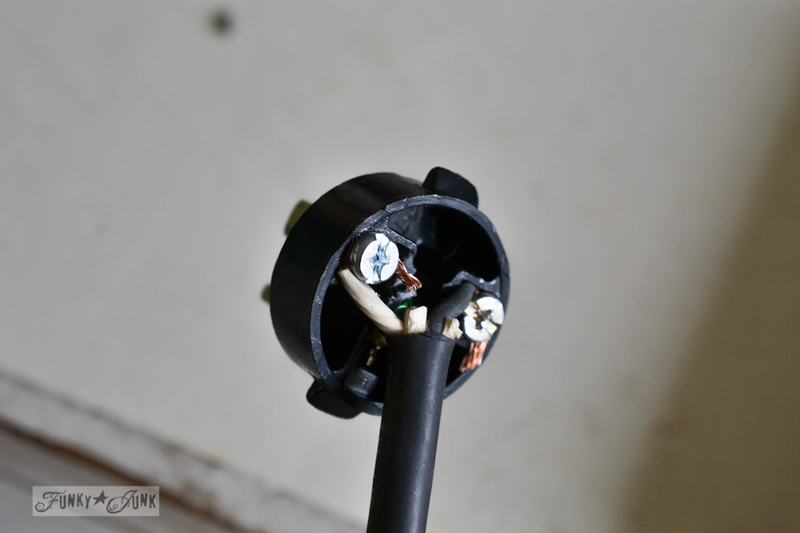 Attach the white wire to the white screw and the black wire to the copper screw. 4. Tighten the wire screws well so the outer cap will slip back on. 5. 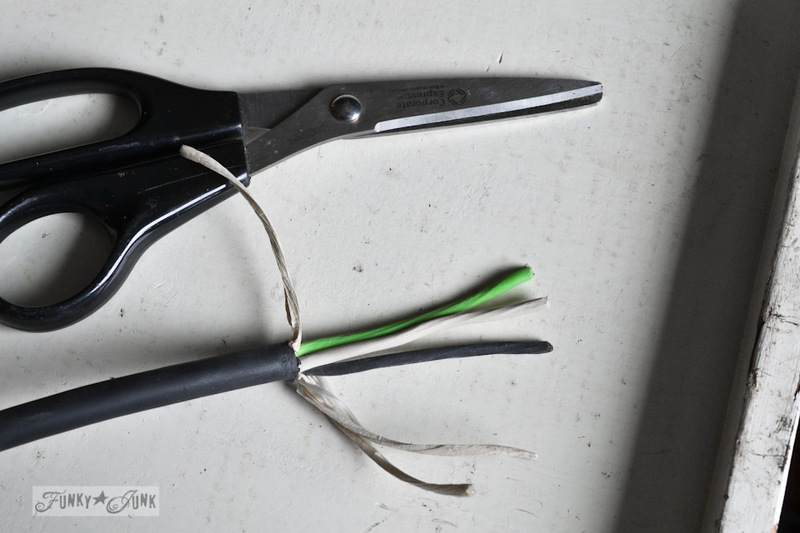 Trim off the copper wires and snip off the green wire. Replace outer cover. – wind the copper wires around the screw in the same direction of the screw so you don’t unwind your masterpiece when you tighten things up. – if your wires start to squish out when you tighten the screws, unscrew and try again. Neatness counts here! – I did the wiring 3x before I was happy with it. Newbie, you know. – I would never win a wiring kit description award I’m sure. ** The knot above the socket was created so the weight of the shade fell on the knot, not the socket. I thought it was a good idea until someone told me this could overheat the wires. Clamping something on the wire to take the weight may be the better option. Please knot at your own risk. Cool. I felt a little giddy at this point. You have lots of plug options. For a lamp, I didn’t need a 3 prong plug but I bought it anyway because I liked how it looked. 3 prong incorporates the ground wire. Although I didn’t include the ground on mine, please seek advice whether you should or not on your project. 1. Remove the clamp and take the cap off the plug. The plug components were a very tight fit so I used the butter knife to carefully pry the pieces apart. 2. (not shown) Slip the top cover of the plug onto the wire first. 3. 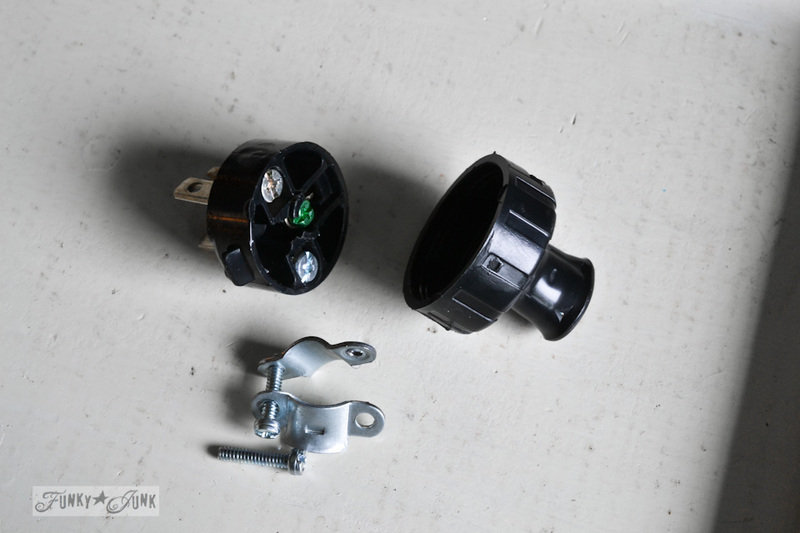 Attach the white positive wire to the stainless screw and the black negative wire to the copper screw. 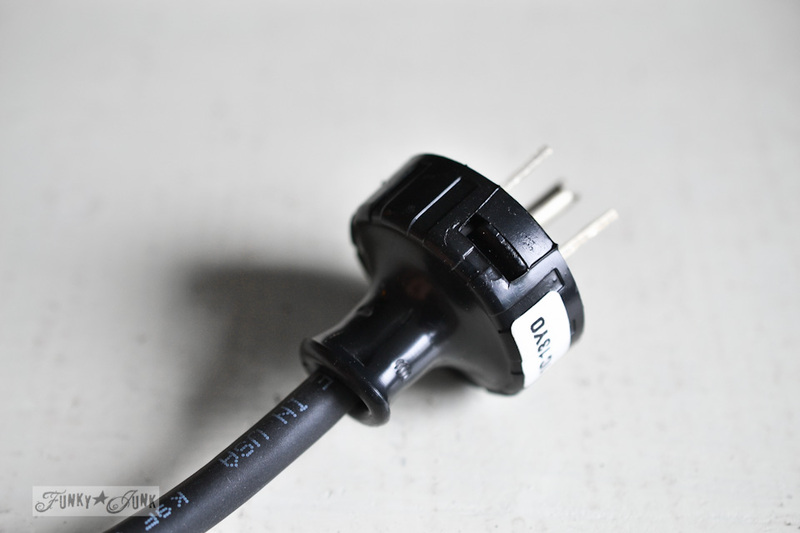 – make sure this is a very tight fit without extra wire slack otherwise your plug cover will not fit back on again. – I did this step 3x as well because of too much wire length AND I forgot to do #2! 4. Slip the cover over top the guts, add the clamp back on (not shown) and you’re done. I admit, I was nervous to plug it in the first time. 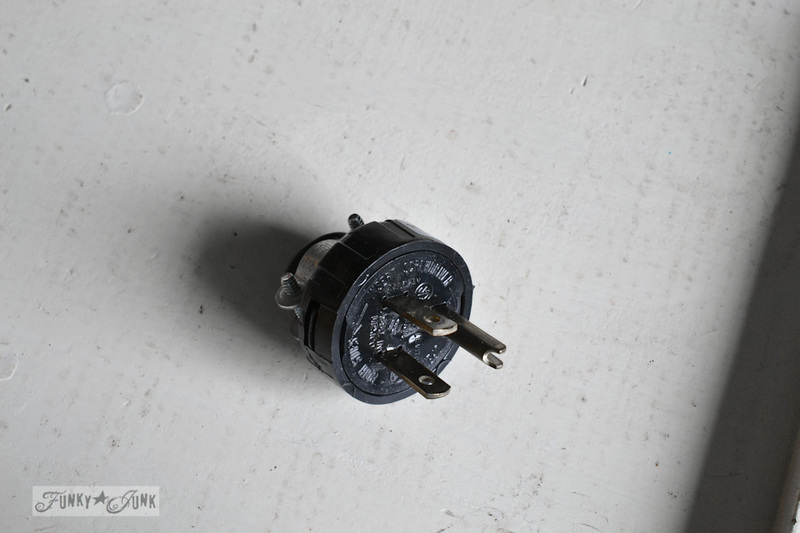 I stood on my toes and inched the plug into the socket with the tip of a finger, then sprinted off. I think I was even wearing my rubber soled shoes at the time. That was good, right?! But I had nothing to fear. It works awesome! Because the cord is exposed on this kind of lamp, you need a place for it to sit. 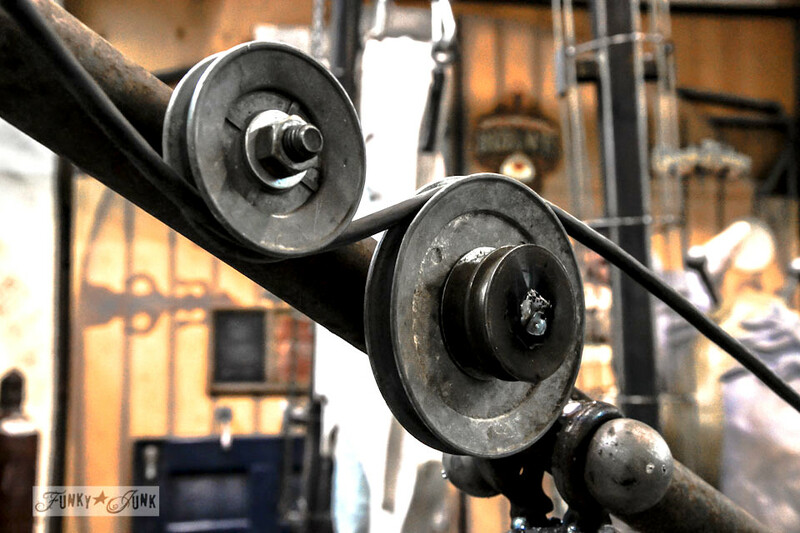 Various wash line wheels and rusty gears were welded together to create a pulley type effect. See? It works!! The oil funnel gear junk lamp is lit and ready to…. How I made the oil funnel gear junk lamp is HERE. Funky wall cabinet storage post is HERE. I have loved this lamp from the day you posted it. 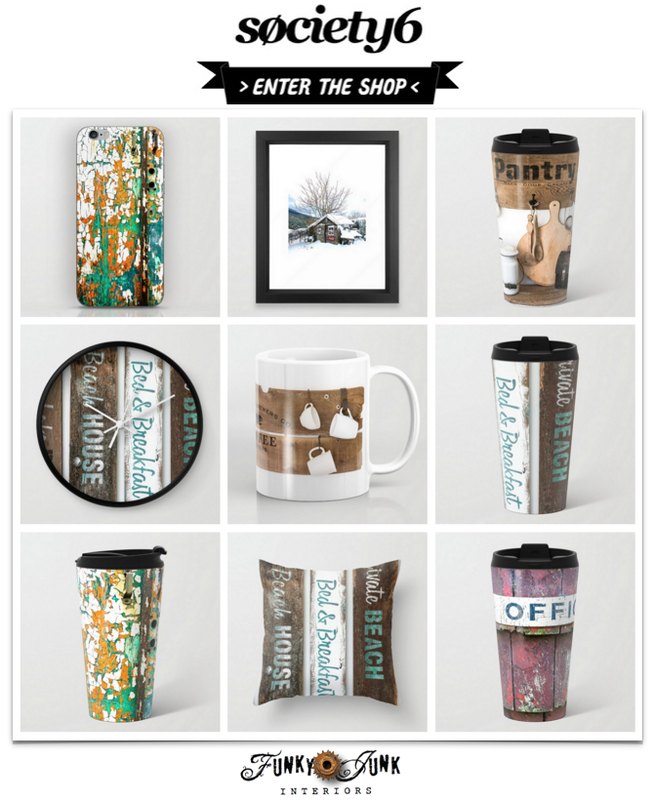 Definitely my kind of junk. 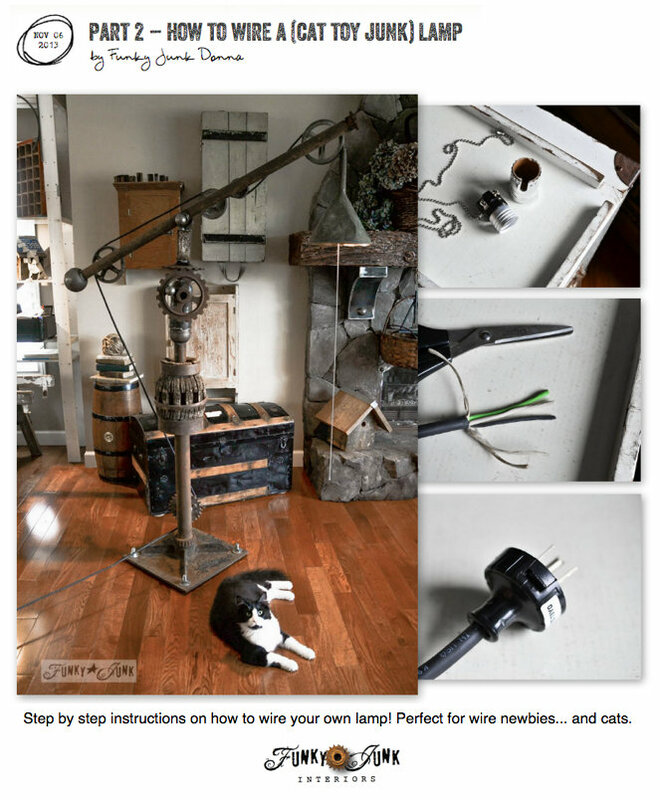 And you are a dear to make this for your cats….I know you didn’t tell the hardware guys this. Don’t you enjoy the hardware guys? They make everything complicated and then pretend they haven’t got a clue what we are talking about. 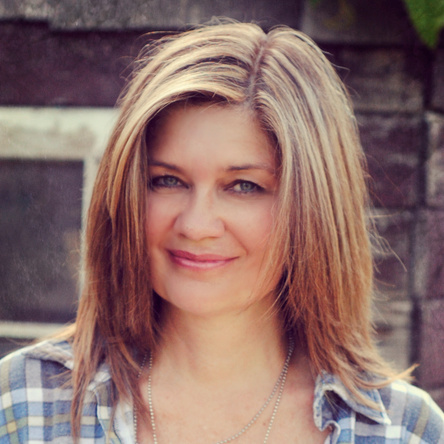 Have had this go on for years…”can I help you?”….no, you don’t even want to get started with me needing help. Except for ACE. They actually enjoy my showing up and helping with the weird or special part projects. And always ask me to come back with pics or a tale of success. Love the lamp, er, new cat toy! Thanks for the easy to follow directions on wiring…I’m working on one myself! 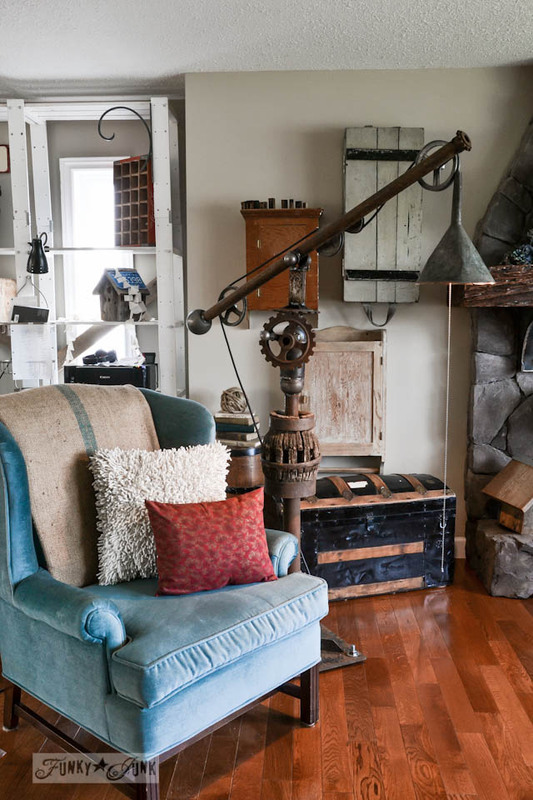 Love the lamp–it is amazing. And the kitty video is an added bonus. Your tuxedo twins are adorable! Haha, yes, I always know where they are now. EXACTLY. Good thing the lamp weights 80,000,000 tons! The pulley effect is my favorite part. Absolutely a clever lamp, the junk is a bonus. 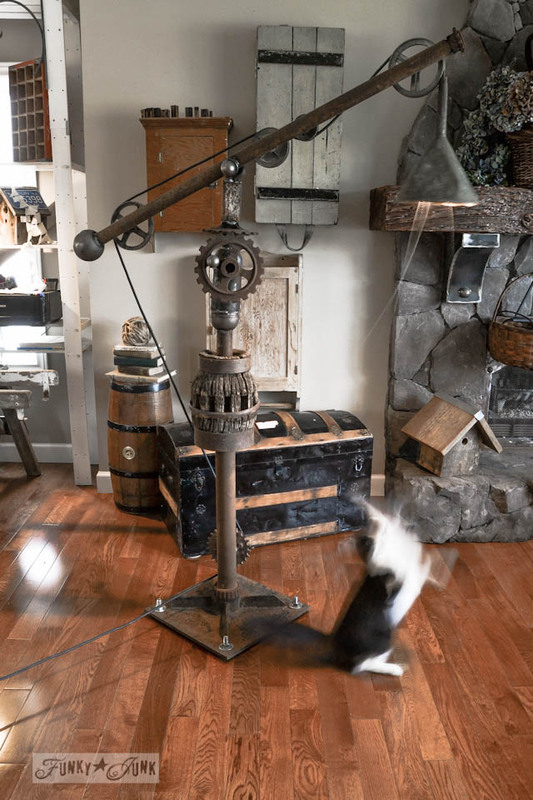 Not only is that the most fab lamp I have ever seen, those two adorable kitties are over the top in cuteness!!! 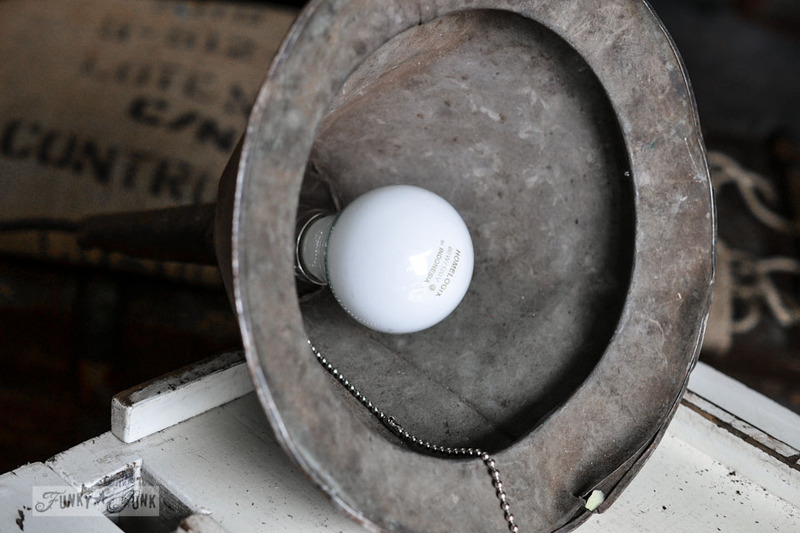 Thank you for the tutorial; I want to make my own Edison bulb lamp and this will help so much! 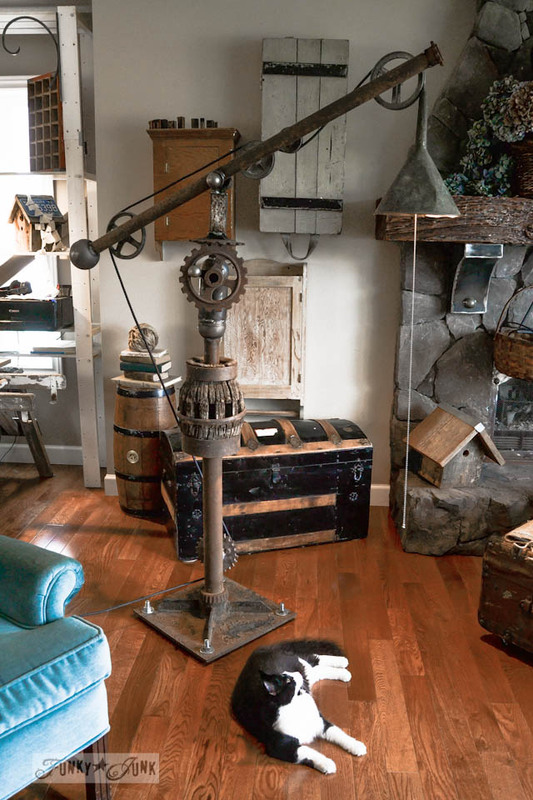 LOVED your lamp, it is helpful to have a welder in the family! 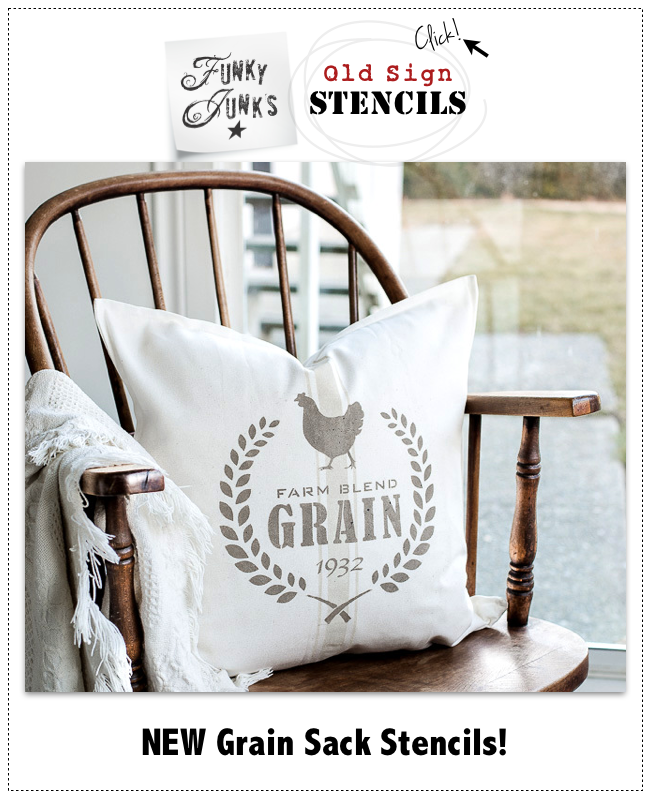 Thanks for taking the time to post about your projects, it is so fun to read your blog. Absolutely love this lamp! What a great job you did. I have been collecting bits and pieces to make an interesting lamp as well. I have the clothesline wheels already and some small gears but I have to say I’m having some serious GEAR ENVY. 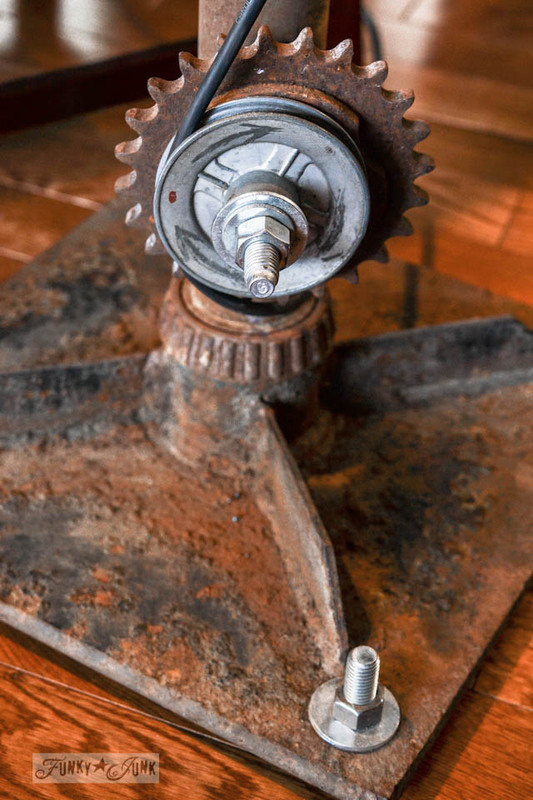 Wherever did you find those lovely large open spoked rusty gears? I need me some of those! I’m cracking up over here and rolling my eyes at myself… when I tried rewiring a lamp, it never occurred to me to cut off the excess wire at the screw — I just kept trying over (and over, and…) until I managed to get the end of the wire under that stupid screw. Haha! Of COURSE it’s a cat toy! Kitties will be kitties 🙂 Awesome bonus that it’s too heavy to tip over. They are too darn cute! Thank you for the tutorial, I hope to need it one day! 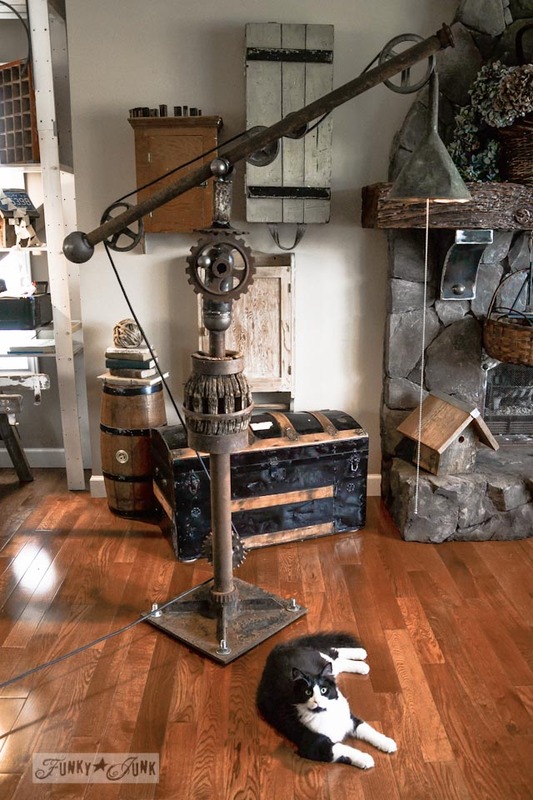 What cat wouldn’t love to come in and turn on the lamp…er, uhm…play with this thing?! I think it is so JUNKY-AWESOME btw! Isn’t everything made to be a cat toy?!? My boy has recently decided my day bed is a scratching post! Not for long though! And I’ve told him it’s NOT negotiable. Hi Colleen! The post above has a link to the lamp tutorial with all those details. But all I added were sticky backed felt tabs to the 4 screws. No scratches in sight and it’s easier to move around too.